National Voters' Service Portal (NVSP) Providing lot of online service. ie. Search your Voter id (EPIC No. ), Apply Voter Id card online, Correction of Voter id card, Know your Both, know your BLO,ERO and DEO, link your Voter id with Aadhaar card, Know your EPIC Number. Election Commission of India the superintendence, direction and control of the entire process for conduct of election to Parliament and Legislature of every state and to office, of President , Vice president of India. Indian Citizen who want to apply their Voter Id card (Enrolment of EPIC No.) those person can log on to National voter's Service Portal http://nvsp.in/ and apply New Voter id card in this portal. Who forgot their Voter id those person also check their voter id, and Correction of voter id services also available in this website. It's National wide Voters information portal, Very state citizens in India can avail these services. 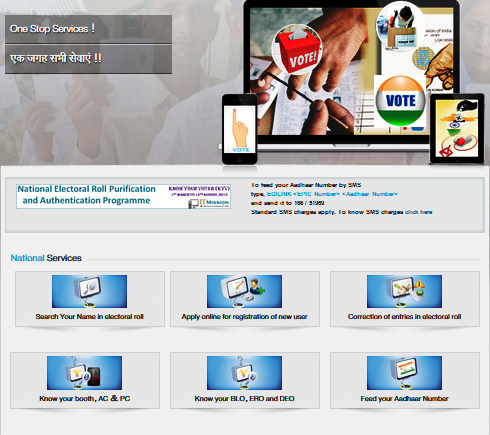 Below mentioned Services are providing in to National Voter's Service Portal. Search your Name in electoral roll. Correction of entries in electoral roll. Feed your Aadhaar Number through SMS. If you want to link your Voter id card with Aadhar Number (UID) through Mobile, just send one SMS through your Mobile number . follow below instruction for feed your aadhar card. How to apply Voter ID card online in andhra pradesh ?